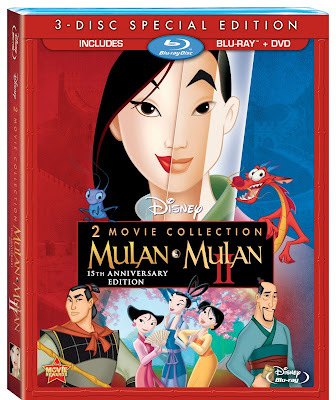 Celebrate the 15th anniversary of Disney's critically-acclaimed masterpiece Mulan with this sensational 2-Movie Collection - presented for the first time in Blu-ray High Definition. Mulan's triumphant tale of honor, courage and family pride shines brighter than ever with new digitally mastered picture and sound! Disney's original animated classic magically transforms an ancient Chinese legend into a spectacular motion picture event. Relive all the wonder and excitement as Mulan breaks tradition by joining the Imperial Army accompanied by her hilarious guardian dragon, Mushu. The adventure continues in Mulan 2, as newly engaged Mulan and Shang journey to a distant city in a valiant quest to save their beloved empire. Your whole family will adore these two extraordinary films on Disney Blu-ray. I was super thrilled to be able to watch and review Mulan and Mulan II. I've been a huge Mulan fan, she's one of my favorite princesses. She was portrayed as a fierce, strong, independent woman who proved every one wrong when she went into Imperial Army disguised as a man. She came out victorious and made every one think twice about how women can defend their country too. This was a movie I loved watching with my daughter and son because it taught them that men and women are equal and should be treated that way. As for the second movie, this was my first time watching it. I enjoyed it and my kids loved it a lot, but I don't think it comes close to the first movie. Both movies visually are perfect on the blu-ray disc, the color, the animations, they all look great! Check out the video below of the song, Reflections. I absolutely love this song. Disclosure: All opinions are my own. I received Mulan & Mulan II at no cost for the purpose of this review. No other compensation was received.